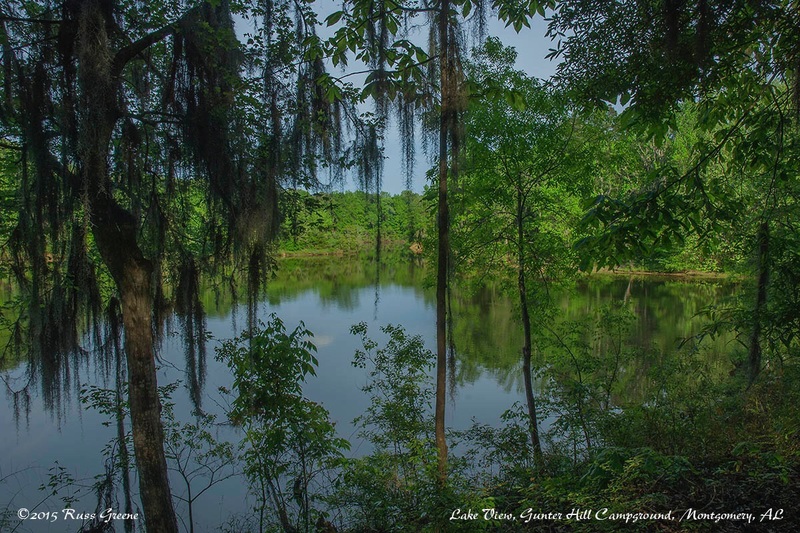 A view from the Catoma loop of Gunter Hill Campground of the Antioch Branch of Bob Woodruff Lake… if I’m not mistaken. 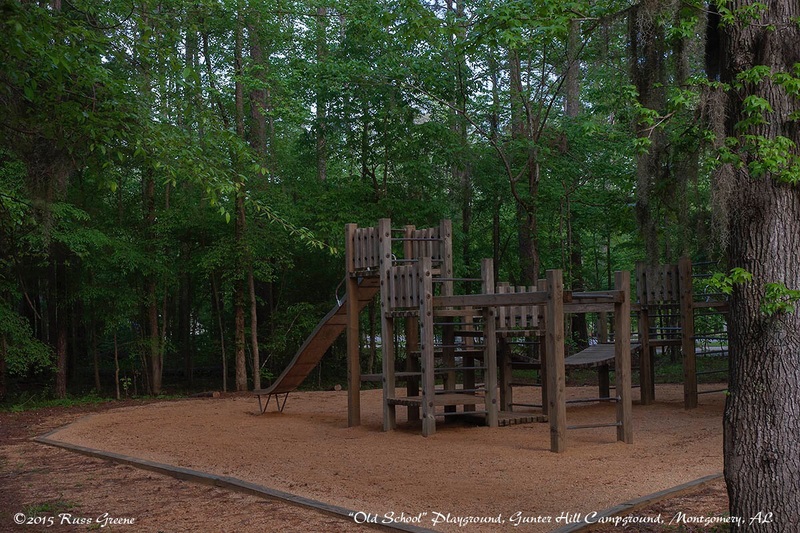 This is one of two playgrounds I saw in the Catoma loop at Gunter Hill Campground. I call the one Old School because the structure is all wood. The other was of the more modern, brightly colored plastic variety. CELLULAR: I am not providing Signal Strength data for voice in this report as all readings were taken were 0%. I suspect that the latest iOS update broke the FieldTester app I use to make these measurements. Antioch Branch from Gunter Hill Campground Catoma loop, Montgomery, AL. Gas: I believe I recall seeing a pump outside B & J Grocery at 5601 Old Selma Rd. just up the road a short distance from the campground. Propane: AllStays indicates Allgas at 4911 Birmingham Hwy. Groceries: There’s a Dollar General near the campground: 6510 Old Selma Rd. and a B & J Grocery at 5601 Old Selma Rd. Prattville may offer better options at a drive of 35 minutes or so. The Catoma loop in which I camped had recently been refurbished,, or maybe it was new. 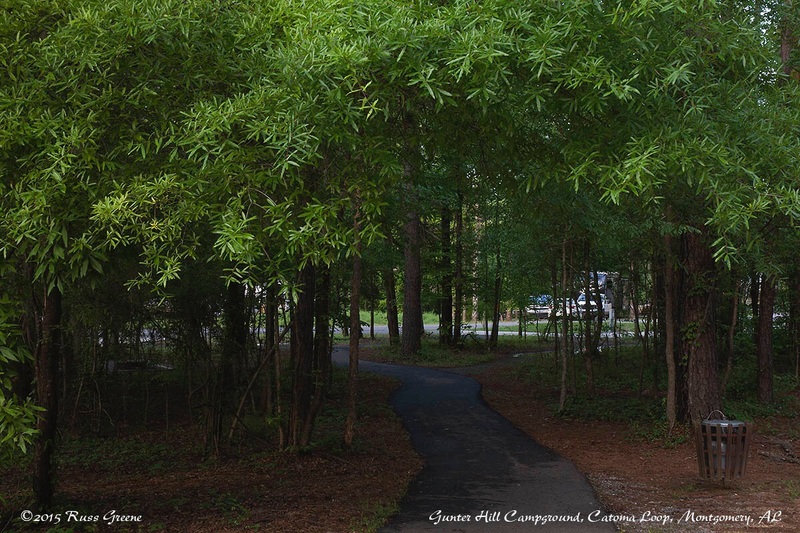 Campsites were well separated, maybe 30′-50′, each had a generous sized concrete slab on which to park with a gravel area containing a picnic table and both waist high BBQ and ground level fire pits, not to mention full hookups. Yes, water, electricity and sewer, the latter being very rare at ACE parks in my experience. Electricity came in 20, 30 and 50 amp flavors. One person with whom I spoke said the older loop, the Antioch loop was even more wooded than the Catoma where I stayed. The sites there aren’t as modern. I don’t think they have sewer. 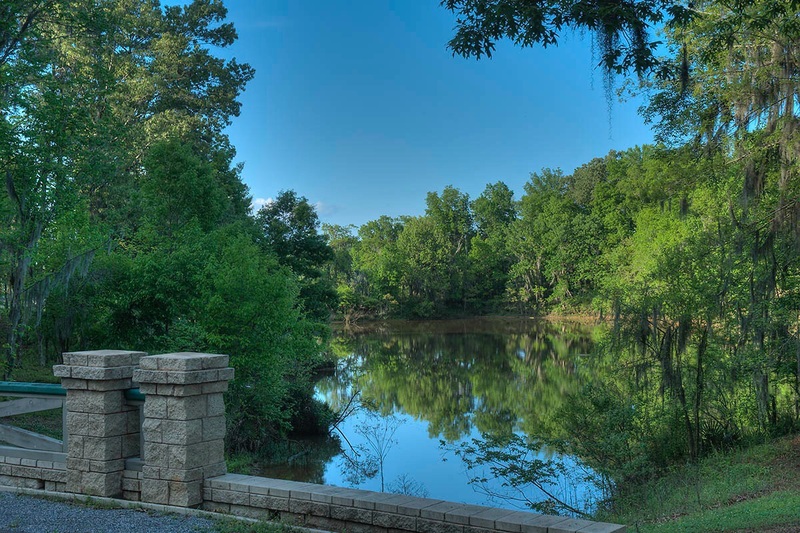 My spot, lucky #13 was close to the water’s edge, with views of the Antioch Branch of the Gun Island Chute off of the Alabama River–I’m a little fuzzy on the topography. I could see the water through the trees some of which were draped with lichen which added to the dreamy quality of this place. It was the time of year when abundant numbers of birds were in the area, calling their mates or singing so as to indicate their availability for partnership. They sang to me in the morning and as the sun set at night. They sang all day long. It was midweek during my stay, during the school year. Consequently there weren’t many children about. There was an occasional military jet that flew overhead. I suspect they were from Maxwell Air Force Base located in Nearby Montgomery. There wasn’t much of that. It didn’t bother me. Showers are located in two separate buildings in the Catoma loop. The one I used did not allow people to adjust the water temperature. I dislike this sort of arrangement, but the water was warm enough, barely, and not too hot. The shower I used had a pushbutton to turn it on. It ran long enough on each push so as not to be annoying. I gave it a passing grade, albeit with some reluctance. I looked in the other shower, the one closer to my campsite and saw it had individual knobs so people could adjust the temp, and shower heads that looked like they should be OK, but I didn’t use those showers. 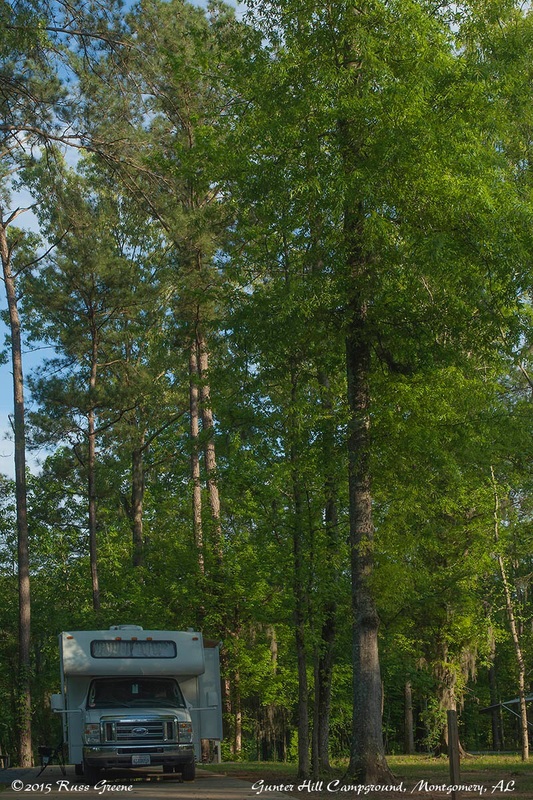 It may be necessary to book well ahead of time for this campground, especially during the high season or weekends; especially considering that with passes campsites can be had for a little as $9. 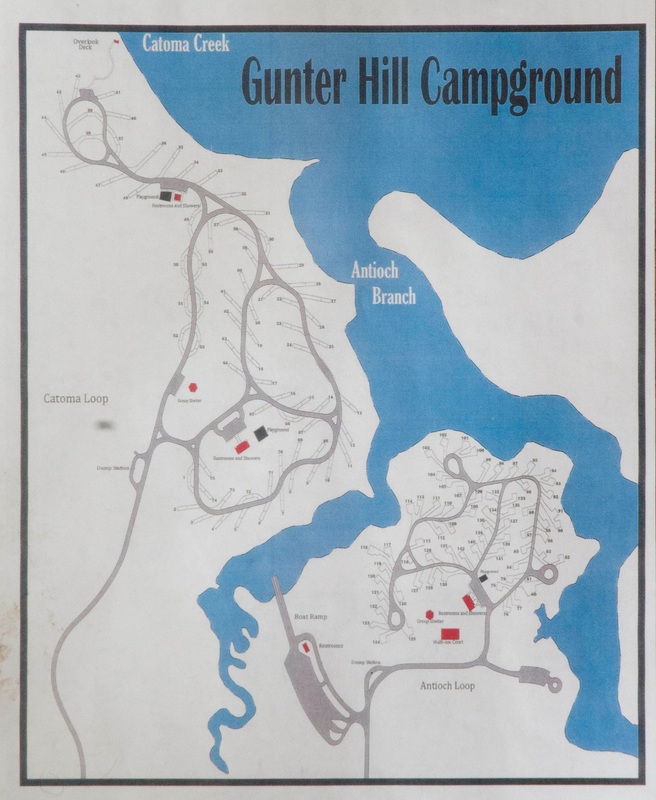 Gunter Hill Campground map. It’s not the best quality image but if you look at the map at full size you should be able to make out the site numbers. Regarding ReserveAmerica as it pertains to this campground, it seemed as if their data base did not have site size information for the Catoma loop and would always indicate that there were no spots available. I think these two things may be related. A phone call to the host unearthed both vacant and appropriate sites. Nice website you have..man what I would give for my wife and I to be able to travel the country like you guys do. We RV only a few times a year…still working…lol. 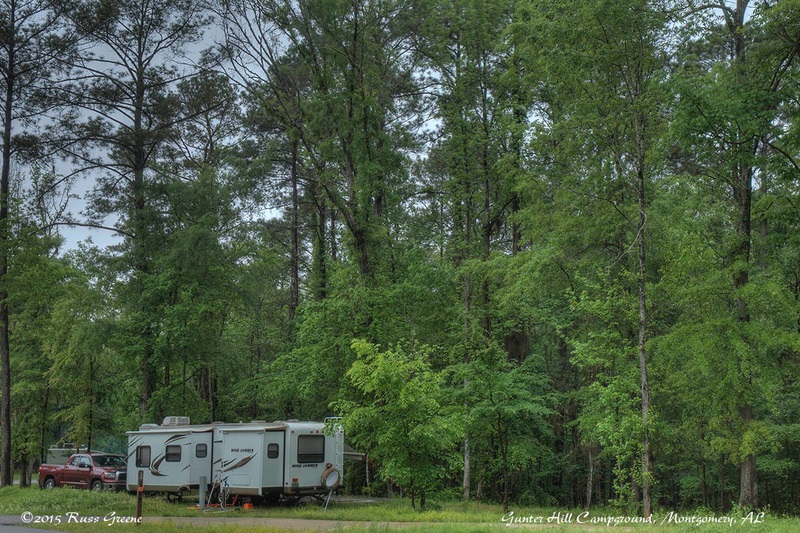 Russ – sure agree that the ‘one temperature fits all’ button at campgrounds are not optimal. 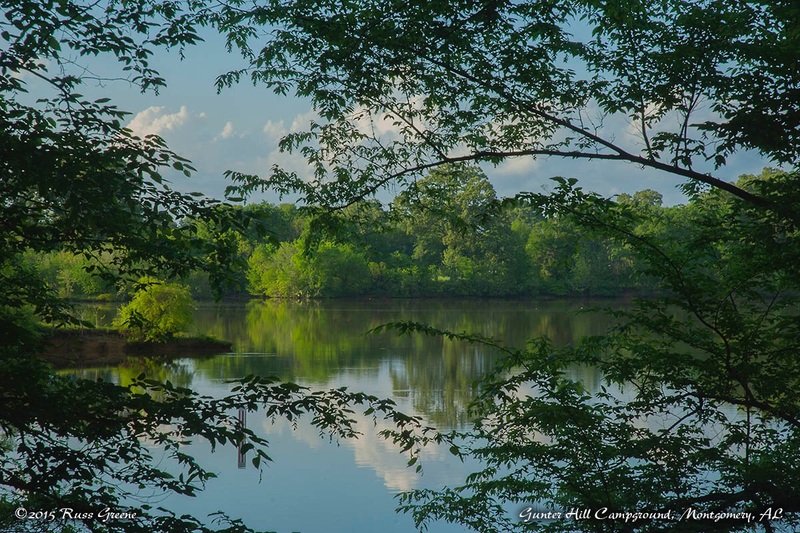 There are several neat Corp of Engineer parks in Southern Alabama on the Alabama River, Tombigee, and Black Warrior. Safe travels. I’d like to hang around Alabama longer but have reservations in FL and GA.